Classes will be on Friday 8.00-12.00 in aula alfa. Instructor contacts: | Prof.ssa Chiara Petrioli | Dip. di Inform. | 06 4991 8354|stanza 311, Via Salaria 113. | E-mail: petrioliATdi.uniroma1.it | Please send an email to the instructor to make an appointment. Results on the summer session are now available. Votes will be registered remotely or in the teacher office Thursday July 20th at 2pm. In case you don't want to register the vote you are requested to send an email to the instructor by the same date. Results of the last lab are now available with a summary of results of tests to far. Votes can be registered June 26th 4pm in the instructor office (see below).Students who cannot come, would like to have it registered earlier or that came on June 5th should send an email to the instrucor with subject "Sis wireless Name Surname Num. Matricola" requesting on line registration. June-July opportunities to take the exam: June 7th 9-12 classroom P2, main campus; and June 30th 2017. it is mandatory to register on infostud. In case you have passed parts of the exam and require a special test you are requested to contact the instrFrom the June-July session the lab exam will be part of the written exam. To pass the exam you have to take a written exam + the lab exam. The written exam provides you with the mark M1 (on a scale out of 30, i.e., with maximum 30/30). The lab exam with the mark M2 (on a scale out of 3, with maximum 3/3). Final grade is M1*(28/30)+M2. In special cases when students pass the written exam but not the lab exam the instructor can provide the option to read and present/discuss a series of scientific papers on topics related to the second part of the course. The maximum number of points for this activity is 2. To pass the written exam read/study all recommended material (slides, book chapters/papers). To pass the lab exam you need to train yourself with the SW and the tools that have been covered in class. Students who have passed the midterm do not have to take additional written exams: they have to pass the lab (on the SDN lab)-or provide the oral presentation. The midterm is valid for the whole academic year. The lab exam can be reserved and taken as soon as a student pass the written exam (or midterm). There are two opportunities to take the lab exam in the Jan/Feb session. The first one is on January 19th (from 2pm to 5pm) in the Colossus Lab, via Salaria 113. The second is on February 14th (from 2pm to 5pm), again in the Colossus Lab, via Salaria 113. Students are requested to book for the lab exam on twiki. Booking is already available on twiki "prenotazioni". You also have to register for the exam on Infostud but the twiki booking will allow us to schedule the exam sessions in the Colossus lab and is thus mandatory (deadline: two days before the actual lab session). Students need to pass the written exam before they can take the lab (you find below in the exam results section the list of students who can currently take the lab exam). An additional final lab opportunity was available on April 27th starting at 14.30, (colossus). From July session lab questions will be included in the written test with max mark 3/3. What if you would like to improve your mark? If you have passed the exam/lab and you redo the exam/lab to improve your mark the new evaluation, bit in case you give the test to the instructor the new test cancels the previous one (so your mark can either increase or decrease). Penalizations: to discourage taking the exam without studying (in light of extremely low quality tests that have been provided to the instructor in January 2017) there will be a penalization on the final grade in case the written exam shows no preparation of the student. Specifically the written exam is made of two sections: 8 short basic questions (domande di sbarramento) and 2-3 long questions (that are corrected only of the first part of the questions are considered above threshold-set to 8/16). Those students who get less or equal than 5/16 in the first part of the test will get a penalization of -2 points on the final grade. This rule is effective from the second session (end of January), i.e. from when it has been communicated. Results till January exam are now available. September 30 2016 Introduction to wireless and mobile systems: challenges. Wireless signal propagation. Techniques for low power design. October 14th 2016 Introduction to cellular systems. Frequency reuse. Principles of traffic engineering. Computation of the blocking probability in a cell. Planning of cellular systems. How to select the size of a cluster. How to compute the interference from adjacent cells. Cell sectorization. Cellular systems dimensioning. October 21 2016 Introduction to GSM. Voice coding. Mobility management. GSM architecture and network elements; GSM radio interface. N. Balasubramanian, A. Balasubramanian, A. Venkataramani “Energy consumption in mobile phones: A Measurement Study and Implications for Network Applications”, ACM IMC 2009. As an alternative in english you can find several books covering the topic. For instance http://eu.wiley.com/WileyCDA/WileyTitle/productCd-1118122380.html chapter on GSM. LESSONS 9--10 O. Berazioli, L. Favalli "GSM-GPRS", second edition, Hoepli. Chapters on GPRS/EDGE and on 3G systems. 2. First January exam results are attached below. (NO_S means students who have not passed the first part of the exam. 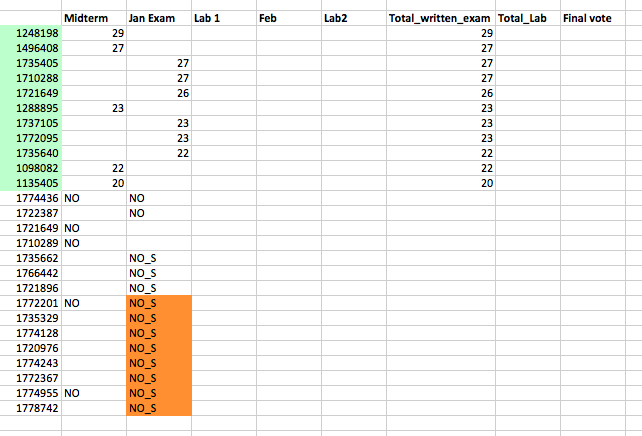 Students highlighted in orange got in such part less or equal to 5/16, requiring significant deeper study. From next session in case of such very low mark the student will get a penalization in the final exam: -2 points in the final evaluation for each submitted very low quality test). 3. The results of the January exams and midterms, and of the first lab are here available. Students in green (LAB TBD) must register and take the lab part of the exam. Students in orange got a penalty due to unsatisfactory part A as anticipated (different penalty depending on the outcome of the exam, only students who got mark <= 3/10 <5/15, according to what anticipated, got a penalty). Ris_sis_wireless_Jan17_lab2_publishable.pdf: Ris_sis_wireless_Jan17_lab2_publishable.pdf 6. April extra lab session results are now available. other students have not passed the lab exam (1741057,1774985,1774151,1773740). Results of September 2017 lab exam: Vinaykumar Kolla has passed the exam with 1/4; 1773740 1741752 and 1741057 have not passed the exam. Hanno passato l'esame orale a febbraio 2014 e possono verbalizzare: 1392443 (28/30) e 1310496 (24/30). GSM (lezioni 4-5). Solo i lucidi della lezione 4 sono per ora disponibili.